Moto E is simple to use. But there is one missed app in Moto E: a native file manager. This happens to Moto G and Moto X as well. Using a third-party file manager app to manage files on Moto E.
This guide will show you how to use one of the best free file manager app, ES File Explorer File Manager, to manage files on Moto E.
ES File Explorer File Manager is probably the best (arguable) third-party file manager for Android. It is a full featured file explorer and manager. Actually, the app has so many features and functions that very few users use all features. 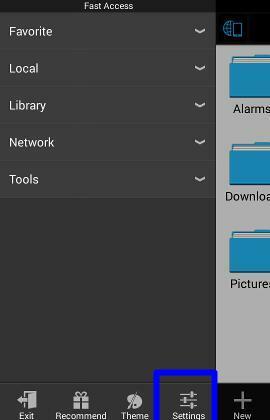 Not just managing files on Moto E, ES File Explorer File Manager can also work as cloud storage client (compatible with Dropbox, Google Drive, SkyDrive, Box.net, Sugarsync, Yandex, Amazon S3, Ubuntu One and more), a FTP client, and a LAN Samba client. Although packed with so many features, the app is very simple to use for new users. Equally important, there are no ads for this free app. You ca get ES File Explorer File Manager for free from Play store. 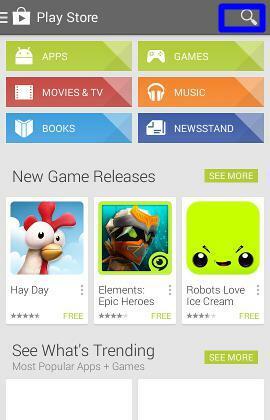 In your Moto E home screen, tap Play Store icon. 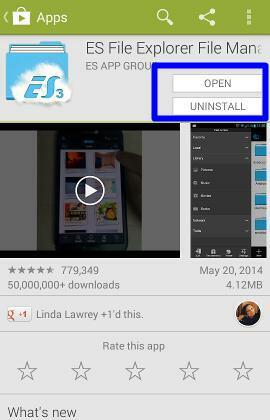 In Play Store app, tap the search icon to search for ES File Explorer, as shown below. 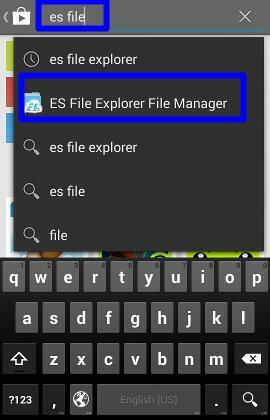 Then tap the ES File Explorer File Manager. Now you are in the detailed info page for the app. Tap “Install” to install this app. Of course, before this app (ES File Explorer File Manager) is installed in your Moto E, you are alerted for the permissions this app requests. You can review the permission for this app. If you feel uncomfortable with the permissions, you can choose not to install it. For apps with good reputation, like, ES File Explorer, you don’r worry about the permissions. But for some unknown apps, or apps with poor rating, you’d be careful. Anyway, you need tap “accept” to proceed to the installation. Once the installation is finished, you can find out the options in the app detailed info page is “Open” or “Uninstall” . By default, once you install a new app in Moto E from the Play Store, the app (actually a shortcut) will be added to Moto E home screen. Of course, you can turn off this feature in Play store settings. You can quickly launch the app from home screen without checking the app drawer. How to configure ES File Explorer File Manager on Moto E? If you open ES File Explorer File Manager the first time, after showing some tutorials, the app will start with your internal storage as the home directory. 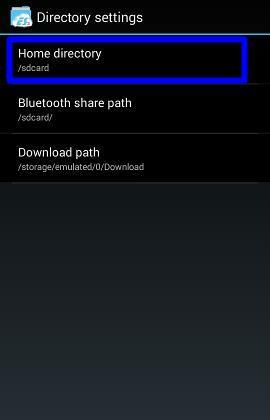 Also, there are default bluetooth share path, and default download directory in ES File Explorer File Manager. You can customize all these default directories. 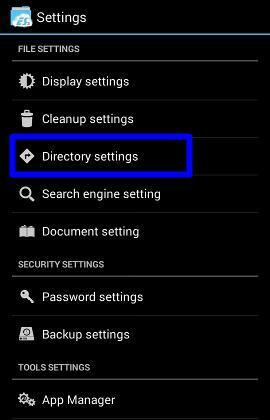 How to configure home directory on Moto E? Normally, after you insert a SD card to your Moto E, you want to manage files in both internal storage and the SD card. Step 1: Start the ES File Explorer File Manager by tapping the icon in home screen. Step 2: Tap the fast access button as shown below. Then tap the settings button. Step 3. Tap Directory settings, then tap Home directory as shown below. 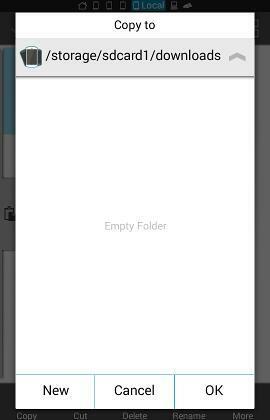 Step 4: tap the “^” button , then navigate to /Storage folder as shown below. Tap OK to set current folder as the default home directory. Next time , when you start ES File Explorer File Manager, it will start with /Storage folder so that you can quickly access both internal storage and external SD card. Please note, in Moto E, the sdcard or sdcard0 means the internal storage. Your external microSD card is always named as sdcard1. It is very simple and intuitive to manage file on Moto E with ES File Explorer File Manager. To copy/move/delete a file, tap and hold the file. The file will be selected and the app enters into selection mode. You can tap any other files to make the selection. Once you select all files, you can use the traditional copy, cut, delete, and rename buttons in the bottom. 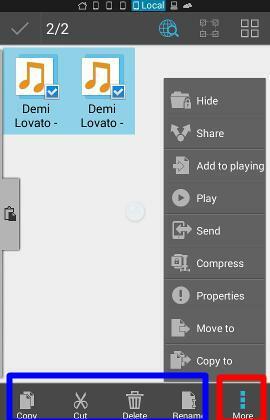 Alternatively, you can tap the more button to get more functions, including sharing, sending, compressing…. This usually works faster. For example, you can choose Copy to then select the folders. This is faster than tapping copy button, then navigating to the destination folder. Do you have any questions on managing files on Moto E? Please leave a comment if you have problems or questions on how to manage files on Moto E with ES File Explorer File Manager. First, the pre-installed ringtones cannot be deleted (unless you root your Moto E). When you try to setup ringtone, it directs you to individual files. This is very likely due to your choice of “Always” when you have the options of “ES File Explorer” and “Media Storage”. You should have chosen just once. You can reset this by going to Settings–apps. Find and tap ES File Explorer, tap clear defaults. You can manually move the files to SD card. Whether an app can write to SD card automatically is decided by app developer, not the phone or user. if i want that that my default drive is SD Card and my photo, music, anyone store directly in sd card then what i do for it and there is needed to create extra folder in sd card. Please suggest me that which folder need to created with what name. For camera, you can set the storage location as phone or SD card inside the camera app. (flick from left side of the screen inside camera app). Once you choose SD card, Moto E will create a suitable folder for it automatically. You cannot change the folder name or location in SD card. So, you only need set it up. For music, you can put it anywhere in the SD card. All music files will be indexed and available in the Play music. Anyway, ES file explorer is for you to manage files. It has no permissions to manage other apps. For any third-party apps, they may have they own default location settings. I had transfered music files in the SD Card, but when open the Play Music app none of the file is appear. I have tried with other music players, also cannot detect the music files. Please advise. how to set ringtone in moto e?? Copy your ringtone which you have to change from PC inside the ringtones folder. Go to Settings–Apps, switch to “on SD card” tab. Check the apps in this tab, then follow the instructions to move apps to SD card. We will release a short guide for moving apps to SD card on Moto E.
Please note, only apps in this tab can be moved to SD card. Please help me to find how to move all the media files(including mp3,mp4 etc) to external SD card. Also how to set the external SD card the default receiving folder? In es file manager, you can move the media files just like what you do on a pc. You can go to settings – storage – move media files. The receiving location is decided by individual apps. Some allow you to change it, most don’t. You cannot change the LED color on Moto E. It is always white. If you get this error code, very likely, the data are corrupted. You should go to Settings–Apps, find the app, then tap clear cache and clear data. In ES File Explorer, navigate to the MP3 file, tap and hold and hold the file until it is selected. After the file is selected (indicated by the check mark in the right side), tap More button (3 vertical dots), tap share, choose Bluetooth. I have moved all mp3 files from internal to SD Card through ES. But now the songs are not showing in Play Music. Why ? If you move them through ES file explorer, the system does not scan it. You should use one of the two methods: 1). Settings–storage–move media; 2) move to PC, then from PC, move them to SD card. For your case, you can try to reboot the phone to see whether the files are scanned. If not, move them to PC, then move to Moto E.
I already rebooted Moto E. No auto scan. When 4.4.3 will release in India for official update on Moto E ? For us version, 4.4.3 update was available for some time. For India version, it should be available in Q3 as I know. The media scanner now works in a different way. It will not scan files that are exchanged through 3rd party apps. Most apps cannot directly be installed to SD card. You need manually move them. After moving the apps, clear the app cache (settings–storage–cached data). Then try to install again. If there are still not enough space, you have to remove apps….. There are two screens, home screen and app drawer. For home screen, you can delete apps on it. You can also change settings in play store app so that new apps are not added to home screen. For app drawer, the Google launcher doesn’t support hiding apps. You have to use third party launcher of you really need to hide apps. can you tell me how can i see my stuff of my sd card? After opening ES File Explorer, tap the menu button in top left (half earth, with a phone). You should find sdcard1. This is your external SD card. You can also tap the the Home button (the top row, first from left, small ones). It will shows your storage usage. It should list 0 and sdcard1. Tap sdcard1 also brings you to the external sd card. how can I delete all contacts with a single command? You contact is sync with Google. very likely, the video is streamed (for example, YouTube), and therefore you are not allowed to download. There are some apps to download videos. You may try some of them. Well, I don’t know why my comments not get posted here but I want to know is there any way to restore deleted MP3 files from micro SD card without using PC. Any app for moto E ? Normally, once you delete the file, you cannot restore it. This is different from Windows: you don’t have a recycle bin. Of course, if the file is extremely important, you may seek professional services. They usually charge a lot and they NEVER guarantee they can get your files. There are some apps to recover the deleted files. But I would not recommend any of them because it may cause other data loss. 1). Did you try a different usb cable? 2). Did you see any symbols (or notifications in Moto E after you connect it to the USB port in your PC? 3). In Windows Explorer, did you see any new items? I have set the bluetooth share path as /storage/sdcard1/Bluetooth after that also if i am getting any song or pics via bluetooth, it is saving in /storage/emulated/0/bluetooth folder. Why is it happing? Please advice and provide solution so that bluetooth share files can save diretly into /storage/sdcard1/Bluetooth. Also, The same thing is happing on downloading any songs or pics. The path settings is only for ES File explorer. ES File explorer can connect to other device via Bluetooth. If you receive files directly from Bluetooth, the location is managed by the system. ES File explorer does NOT change your system settings. Similarly, the download location is only for ES Download Manager. Some apps, for example, Chrome, have own default locations and ES File explorer cannot modify it. They are identical. In Linux, sdcard0 is just a symbolic link. 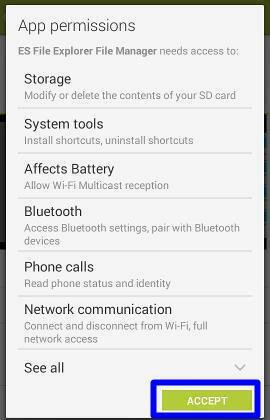 Bluetooth share pics i have moved in Sd card via ES file explorer then i have seen that in phone storage that its taking internal memory as well and sdcard. Then i have deleted those pics from gallery then it has been deleted from sdcard also. why is it so? If you copy the files to other folder, then these files are independent. In the gallery app, the images will be shown in two different albums (because they are in different folders). If you delete one from a album, the other one should not be affected. You may delete the wrong one. Also, if you moved, the file should not longer exist. Anyway, you can try again: copy the file to another folder, then delete the original one. The copied one should not be affected. I am having Problem in Whatsapp. It is directly storing data in my phone memory. Please give the solution. Whats’s app always store in Internal memory and you cannot move in sdcard.There are also some others apps which can store in internal memory and can not move in sdcard For example – Attivirus. I mean to say that whatsapp is saving media in my phone. I want that media in my sd card. Such settings depend on the app. Unfortunately, WhatsApp does not provide such an option. You probably have no choice, but to manually move the media files. I didn’t get any reply from your side for the above 2 question raised by me. i am not able to play youtube videos..whenever i open a video it says there was a problem while playing touch to retry …what should i do? i have also done clear cache partition. Very likely, the internet connection is not good. Are you using mobile data? Some carriers may also impose some speed restrictions on video streaming. Can you play YouTube on your pc with the same wireless network? i created a folder for photos using file manager. but it is not displayed when i open gallary. why ? Did you try Photos apps? Also, how did you copy the images? I was on a website and suddenly it goes to a new page open and it shows your Android phone has 7 virus. Install the antivirus now otherwise it will harm your phone. Is that a promoting ad or my phone has virus ? You should never trust such sites and such apps. Of course, you should not install it. If you install apps from play store or other reliable sources, you don’t need any antivirus app. Did you install it from Google play store? When did you get the error message, downloading or installing? You may reboot your Moto E and try again. Is there any way to delete a radio station from FM radio in Moto E ? You can only delete the radio station from your favorites, not from the scan list. My App is not supported with moto e, any special permition for that. Pls give me any solution. The ES File explorer is surely supported in Moto E.
If you sideload other apps, you need make sure the app is compatible with KitKat 4.4. Some old apps may be not compatible with KitKat. Also, you should get apk files only from reliable sources. You should try to get apps from Google Play store. Any image files whichis shared by bluetooth or what Apps, store in sdcard0 (i.e. Internal Memory).If we move these images from sdcardo to sdcard1 using ES File Explorer then they stored in sdcard1. Now it should consume external memory space but if i am navigating as Setting->Storage->Looking for pictures,videos then still its displaying 1.03MB for same. Why is it so? Internal memory should be free after moving pictures from /sdcard0 to /sdcard1. Did you check whether the file is actually there? If the file is not there, it will not use the storage. The settings is using cached data. It may not update in real time. How delete all contacts on time ? You can only delete contacts one by one in Moto E.
Contact is sync with your Google account. It is more convenient to do such bulk management on your PC. Google Play music is the default music player in Moto E.
If you don’t like it, you can get some from Play store. Go to Settings–Apps–All–media storage, tap Clear defaults. Update may be rolling out in different time for different regions. If Moto G tells you the software is up to date, if means the update is not available for your phone model yet in your region. You just wait. How can I reinstall apps after uninstalling them? You can download again from play store. In play store app, you can tap the menu (top left) and tap my apps, tap all, the uninstalled apps are list there as well. Tap it to install again. Tap the hold the text input area, the paste option should pops. Tap paste will paste the contents in the clipboard. To copy contents to clipboard, tap and hold any character, then drag to select more characters/word, in the top, the copy and cut options should appear. Settings-apps – es file explorer, clear defaults. how i hide folder on MOTO E…….. The launcher in Moto E does not support this. You can try third-party launchers from Play store which may support this feature. The music player doesn’t have this feature in Moto E.
After inserting simcard in moto E, all contact which in sim are not displaying in people app. tell me solution..
in people app, tap the menu key, then tap import/export. You can import the contacts to the phone. (but you cannot export contacts to SIM card). How can i see whats there in my sd card? I mean aal the stuff i moved from my computer like .apk games? where are they stored? how can i see them? pzlzz tell! When you move /copy files to the phone or SD card from the pc, you should remember the folder. SD card is sdcard1 in Moto E. Use es file explorer to navigate to the location to manage your files. I moved all my downloaded music from my tablet onto my External SD Card. Now I can access it on es file explorer rather easily but I can only play one song.. I cant skip from song to song without having to go back and find another one.. How do I bypass this? Should I just move all my music back onto my device? It can play both audio and videos. Open the app, tap the menu key (3 vertical dots), tap settings, tap audio, tap audio player (to make it checked). Now return and refresh the folders. All music and videos should be there . VLC for Android is also good and may be simpler to use. How do i share apps downladed from playstore on my moto e to any other phone? You cannot share them. Otherwise, the installation of paid apps will be of control. It’s possible to backup apps, then reinstall then in another device. You may try Helium. It’s free on play store. Please follow the inductions of the app and you have to install Motorola USB driver. Quickoffice normally can open docx file, not doc files. You may try wps office, which has no issues with both doc and docx files. No, Motorola no longer provides such tools. For apps, you can sync with Google, then manage them in Google. i am unable to connect to internet in my moto e, i hav done settings>more>mobile networks>data enabled. First, WiFi is used only when the phone is connected to a wireless router. For mobile data, H means HSPA, which is faster than normal 3G. When you see H, you should have be able to connect to internet. Once it disappears, you should see other symbols because the connection should fail over to 3G or 2G. Can you check your network type settings under mobile networks? You may change it to auto. how to move media from sd card to phone in moto e? As explained in this page, you can use es file explorer to manage files in your phone as in pc. You can cut and paste to move any files from SD card to the phone storage. How can i type capital letters continiously in messaging? And also can i change its qwerty keypaid to 3×4 or else? Can i move my apps to SD card from my Moto E’s internal memory? 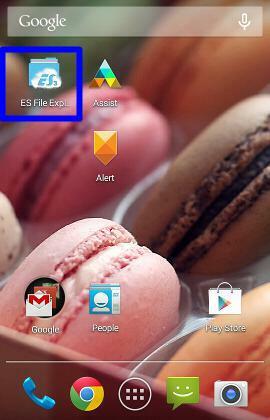 I have installed ES explorer in my moto X. I am able to hide the files in the hide folder. I have an app installed on my device called ZArchiver in which the folder with all its contents that I have hidden is still visible. How can I manage it? There is no way to completely hide files or folders on android. How can i connect moto e to a secured wifi network if i know the password of the wifi.? You turn on the wifi. The ssid of the network will be scanned automatically by Moto E. Tap the ssid and you will then be asked for the password for the connection. As i download the songs from UC browser and stored in SD card. The Files are available in ES File Explorer File Manager but it is not available in Music Player. Once I switch off and ON the mobile i can find the newly downloaded songs in Music player. Once I download some songs I keep on doing the Process. Please let me how to get the Songs in music player without switch off the mobile. Rebooting the Moto E should update the file list. Very likely, these files are copied to the sd card when it’s not in the phone. I cannot move downloaded files from intenal storage to sd card..and also i cannot create a new folder or new file in external sd card…can you pls tel me the suggestions..
Any error messages? are you using ES file explorer or other file managers? Any error messages? You may try to copy, not to move. How can I open hidden folders in moto g2, which were hidden by me in Samsung phn by naming it with a ‘.’ .pls help me out with this issue. These hidden folders are in my extSd card. Pls suggest. You just need turn on show hidden files in ES File Explorer. Open ES File Explorer, tap the menu (top left, 3 lines), tap Settings in the bottom. Tap Display settings, check Show hidden files. You can use other third-party launchers (e.g., Nova), which usually give more options in font selection. How did you compress them? Which app was used? plz name an reliable antivirus app for MOTO E.
Antivirus is NOT necessary for Android. Just remember to get apps from reputable market, e.g., Play store or Amazon app store. Most such apps drain your battery without any benefits. Whenever I open my gallery y does it says no storage available ??? It happened after installation of es file ?????? it is unlikely caused by ES File explorer. Anyway, you may try go to Settings–Apps, tap the menu key in top right, tap reset app preferences. Then reboot the phone. If you still believe it is caused by ES File explorer, you can always uninstall it. But I don’t think so. it is really a bad idea as your Moto G has very limited phone storage. You should save photos to the SD card. Anyway, you can change the storage location inside camera app. Open camera app, pull out the ring from left side of the screen, rotate the ring, tap the sd card icon (above 16:9), then you can set the photo storage location. And I am also not being able to update the time? Every time I change it, it reverts back to the old time?? Settings–Date & time, uncheck “Automatic date & time”. What errors do you get if you use es file explorer to move the files? You can navigate to Bluetooth folder, select files, choose move or cut to move to the desired location in sd card. Hey guys… I have moved Bluetooth folder frm internal storage to sd card… Nw I cant receive any files frm bluetooth… Its showing me “storage issue” whenever I try to receive any file from bluetooth… Any solution? You should not remove the Bluetooth folder from the internal storage. I tried to create a new one but Fail!! Try to create one when connecting the phone to the pc. How to uninstall appa that are already present in moto e.
The pre-installed apps cannot be uninstalled. You can only uninstall apps installed by you in settings – apps. For some non-essential pre-installed apps, you can disable them in settings – apps – all. Hi, This is very useful. Thanks. But How to transfer Whatsapp Databases from my internal storage to Pc? I downloaded ES File Explorer, but when i connect it to PC by USB , i am unable to see any databases in WhatsApp folder except images and videos. No databases are shown. I need these databases so that when ever i want to reboot i will copy them to my pc and reboot my phone so that i wil be able to save the previous conversations. How to copy the files from phone to PC ? Rebooting the phone doesn’t delete the messages. The messages are encrypted. You should not copy them directly. You should backup messages in WhatsApp. Open WhatsApp, tap menu key – settings – chat settings – backup conversations. Then you can find the backup messages on backup folder under WhatsApp folder in the internal storage. The backup file is also encrypted and it can only be restored on phones with identical phone number. Once you select the files or folders, tap the more button (3 vertical dots). You can then find the hide option. It’s not a good idea to hide or encrypt files in the phone. You should set lock screen password instead. There is no easy way to attach contact info on messages in moto e.
Mobile device is considered as personal device, so there is no log out feature for Google account. You need remove your account from your friend’s phone at: Settings–Google (under Accounts), tap your account, tap the menu key (3 vertical dots) in top tight, tap remove account. how to install game with cache in moto g 2 plzz help……………………..? Moto E is not designed for large games due to its small internal storage. Please note, you can only move part of the app data to sd card. This is decided by the individual app developer. I have a moto e and I have a pny otg . I have loaded es explorer file but the otg is not recognised. I have already mentioned about it yesterday still there is no reply. Please let me know what should be done. Moto E does not support USB OTG. I have installed es3 file manager in my moto e.
How can I set es download manager as my default download option when downloading videos. I am seeing the options only as video player and photos. ES file explorer can not act as download manager. To download files from internet, you still have to go through the web browser, which is hooked to system download manager or its own download manager. How to copy ,save or transfer Text messages on Moto e. or using ES explorer ? You can use some sms backup apps to backup your dms messages. Fire individual messages, you can tap and hold, then share top other apps. Es file explorer cannot handle messages. Hi I downloaded Es explorer, I want to delete download files…my friends deleting download files ….but download files are shown in download list as icon when I tried to open it shows as media files not available… Is it possible to delete selected downloaded files..? Rebooting the phone should clear the list. where did you download the songs from? If from the internet, it is probably due to the internet connection. If you are using mobile data, the problem could be due to the mobile network. You should download only when your mobile data connection icon is H or H+. For 2G data connection, timeout is very common for large files. But there is a small problem for which i unknowingly am responsible and badly need a solution to it. I don’t think there is an easy way to do it. You may some check with some professionals on such issues. You may check with the app developer on this issue. If it is easy to hack or bypass, then it loses the points of encryption. don’t know what program the author was writing about but comments have absolutely no resemblance to ES File Explorer File Manager. Is it for a specific video or all videos? I have many songs in my sd card but my Music folder is being shown as ’empty’. Please help. Can you check the files on a PC? How did you know there are music files? How to play music via bluetooth to car music system? It depends on the car entertainment system. Can you pair the phone with the car entertainment system? 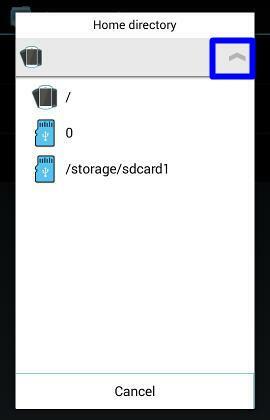 How to change my default download and install locations(Internal memory) to SD card in moto E……. You cannot change the app download and installtion location. It is always internal memory. You can move some apps (actually only part of app data) after they are installed and your files to SD card. What’s the storage usage reported in settings- storage? I have marked one folder containing images and hide it using this app es file explorer.now I am unable to see unhide option.I really want those pictures back.please help. Open ES File explorer, tap the menu (3 vertical dots in top left), tap Hide list (between Music player and Recycle bin in the last). You can choose to Open or restore. Cant do as per stated by guide. 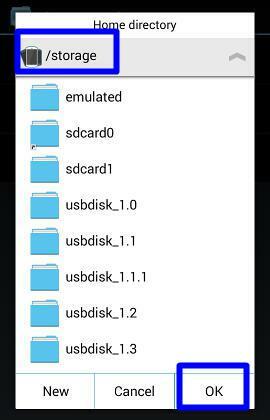 ES File explorer says you cant do this (move files to sd card) as you are using android 4.4.4 you have to root. Whats this??? Although kitkat imposes the limitations on apps to access folders, Moto E is not affected. Settings – apps, tap the menu button (3 vertical dots), tap reset app preferences. I reboot my phone as you said but gallery app doesn’t show pitchers & vides. In my phone device many pitchers and videos. Es file explorer should never do this. It can be caused by other apps. Some app data are not cleared. This is normal. It depends on how you receive the file. Bluetooth or downloading through system download only uses the internal storage. Some apps, e.g.,WhatsApp, can only download files to internal storage. Hi I am using Moto E (1st Gen) recently i had bought Sandisk Ultra Dual On-The-Go 16GB Pendrive. to use this ultra disk pendrive i had installed es file explorer. The pen drive was not detecting before and after the APP installation is there any settings for this or any plz…. I purchased moto e 1st gen on 13th of this month, through flipkart. In this mobile on selecting the ES3 file expr (after installing it, on Step 2) there is no globe icon, instead three smal horizodal line icon only is shown while proceeding to get fast access option. Anyhow after tapping that three lines icon , fast access menu window is shown but all the 5 options from Favorite to Tools are shown as selected ( instead of their arrows in the right side) and the settings icon at the bottom looks like a gear icon and not as shown in Step 2. Also at step 4 in the Home Directory window there is no up arrow icon in the right side but a + sign and AZ letters are there. And towards the left , is an arrow pointing to left side and /sd card option. Therefore I could not proceed accordingly. But after returning to home screen and selecting the ES explr, the window with all the normal folders is opened. When I siwpe right the folder screen a home page screen is shown up with the int. storage option and below that, the micro sd card storage option. On selecting the external memory card storage, it shows the contents and opens further correctly. In the same way the internal storage option also shows the contents and opens well. Also if the bottom status bar is swiped towards right , the fast access menu window is shown. Why this type of options are present and differs from the method as shown in the relevant steps. Is it ok with the current settings in my phone? What I should do? The app always changes the interface. But the core functions are still same. After tapping the 3 vertical lines (navigation button), there should be a Settings button (together with Exit, theme in the bottom). You should be able to tap it to enter settings. thanks simon. To ensure I checked other mobiles and found the same three horizontal lines in the top left portion instead of the globe icon. Some apps must be in internal storage. Some apps (decided by the app developer) can be moved to SD card. But only part of the app files can be moved to SD card. All apps must be installed into internal storage first. You can move media files to SD card in Settings–Storage–move media. You can also use ES file Explorer to manually move some files to SD card. You can also uninstall un-used apps to save storage. Probably no way. This is the purpose of encryption. My ES File Explorer did not have a ^ where you indicated. In any event, I have a 16 Gb external micro SD card, but I cannot seem to get my photos, mp3, etc to save in that location. The computer saves to the SDcard0 which is the internal SD card. I bought the 16 Gb micro SD card for the explicit purpose of adding photos that I knew would exceed soon enough the 2 Gb internal storage Sdcard0. I want to save my photos to the 16 Gb micro SD card1–the external SD card. How can I do this, or why won’t the phone do this automatically? In camera app, you can set saving location. For existing photos, you can go to Settings–Storage –Move media. Upon further examination–it turns out I have been saving photos to the SDcard1–the external 16 Gb micro SD card; the information from the phone settings and the ES File Explorer app and the airdroid app seemed to give contradictory information. But looking closer through the ES File Explorer and the airdroid app confirmed that I was indeed saving photos to the external SDcard1. Many thanks. You can see apps in SD card through settings – apps. Please suggest me apart from the screen lock security is there any app to prevent the opening of apps, files, folders or changing the settings unknowingly or intentionally by the children or friends? Or is there any way in the Moto e phone (kitkat 4.4.4 os ) or through the Es file explr app to set password protections ? please explain in detail. Guest mode and multi-user mode are available only in Lollipop 5.0/5.1 for phones (for tablet, it has been available since Jelly Bean 4.3). You may wait for the update. If the phone is mainly used by kids, you can install Screen Time to control what can be accessed. Download and install VLC for Android, which can play any folders or individual files. In Settings–Apps, tap menu key (3 vertical dots), then tap Reset app preferences. 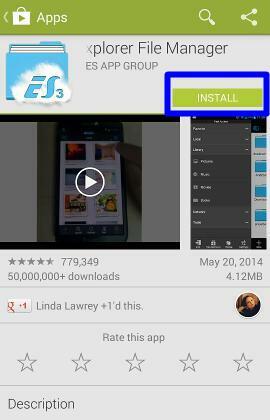 ES File explorer is just a file manager. The photos are still saved in the phone even you move the files. The pics cannot not be stuck there. Can you view the pics in gallery app? I am using Moto E. Till last week eveything fine, now none of the media files are not showing from SD card, My SD card is not detected. I can see the files and media by connecting the phone to my laptop but cant see in file explorer, even SD card is not shown in file explorer. Can you help how to get my SD card media files to be visible in my phone. Try to power off the phone, re-insert the SD card. then power on the phone. Check whether you can find the SD card in Settings–storage. I have done all these already, but still the SD card is not listed in File explorer. But i can detect the SD card storage from my laptop by connecting the phone through USB. In settings – storage, what did you get? The files should be removed after its unzipped and applied. It is only temporally in the partition you can access. Aftet the update, the leftovers should be cleaned. You may check the detailed storage usage in settings – storage. How can I connect an otg cable by using an es file explorer since I saw many people have posted that they are using it?????? Moto E doesn’t support OTG. How can I connect an otg cable by using an es file explorer in my moto e since I saw many people have posted that they are using it?????? Moto E doesn’t support OTG. Moto G and Moto X support USB OTG. HOW TO INSTALL GAMES/APK FILE FROM SD CARD? You can use any file manage (for example, es file explorer) to navigate to SD card, then tap the apk file to install. Please note, the app will be installed to internal storage. You cannot install Android apps to SD card directly. In es file explorer, you can select (tap and hold) files, then move to the destination. What problems did you get? You can also move media files to SD card in settings- storage. unfortunately i deleted all my pics from sd card by analysing the sd card in es file explorer. but the pics are imp i searched in recycle bin too but there is no data. plz give me a suggestion how to recover those files??? If you enabled recycle bin in es file explorer, you can tap and hold the deleted file to restore it. How do I disable the pop up screen that pops up before my unlock screen? What pop up screen? from which app? If it is hard to explain, you can take screenshots and share them in our Facebook page. How can I transfer media file to Pen drive from Moto e through ES File Explorer? Moto E doesn’t support USB OTG. You have to transfer files through PC or could. Not sure what problem you are referring to. Would you please tell us the problem a bit clearer? For example, what do you want to get, and what did you actually get?